Park Library Book Sale: April 4th-11th, 11 a.m. – 4 p.m.
April 4th: 11:00 – 4:00 … Come early for best selection! Payment: We accept cash, check and Venmo! Walk right on in and don’t be discouraged! The staff is happy to help. Find the “Register Here” desk where you can fill out a registration form. Let them know that you are a UNC student. They have a directory of UNC student names and addresses handy and should be able to look up your current address and be able to verify you. Just make sure you have your OneCard with you so that they can verify you match up with the student directory and the registration form. Read this DTH article on who’s running in Orange County, and vote! Same as above, but bring an additional proof of residency, such as a North Carolina driver’s license, government issued photo ID, utility bill, or paycheck. We have a trial of Newsbank’s Access World News through December 2018. This gives us many more North Carolina news sources as in our current Newsbank subscription. The link changes monthly, and the link to Access World News (trial) on the main Park Library page will be updated through Dec. 2018. College newspapers are included too (the Daily Tar Heel from 2012-current, plus the Duke and NCSU newspapers, among others). Temporary access includes archives from the San Francisco Chronicle, the Columbus (OH) Dispatch, and the Philadelphia Inquirer. We’re excited about this trial & would love your feedback! 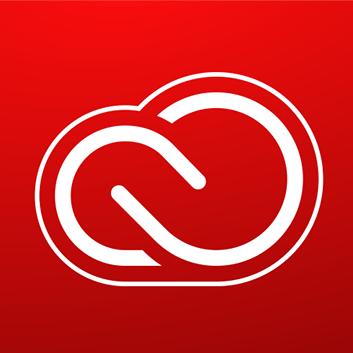 The following videos are from a Lynda series by Petrula Vrontikis. They offer tips on how to enhance your presentations and engage audience members. 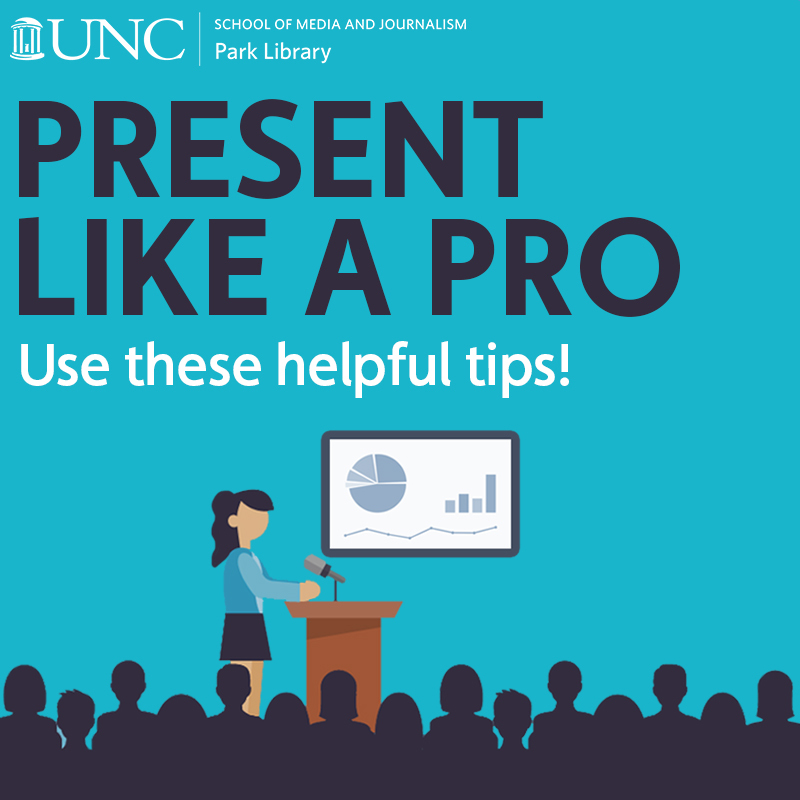 This UNC guide provides resources on using PowerPoint and other design programs. Did you know that the Media Resources Center has over 40,000 streaming films? Watch these documentaries & other titles on your device now! Look for Kanopy under Feature Films and Documentaries to Stream in MRC’s Film & Streaming Media Guide. 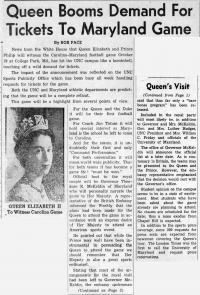 On October 19, 1957, Queen Elizabeth II and Prince Philip saw their first football game, and it starred UNC and Maryland. 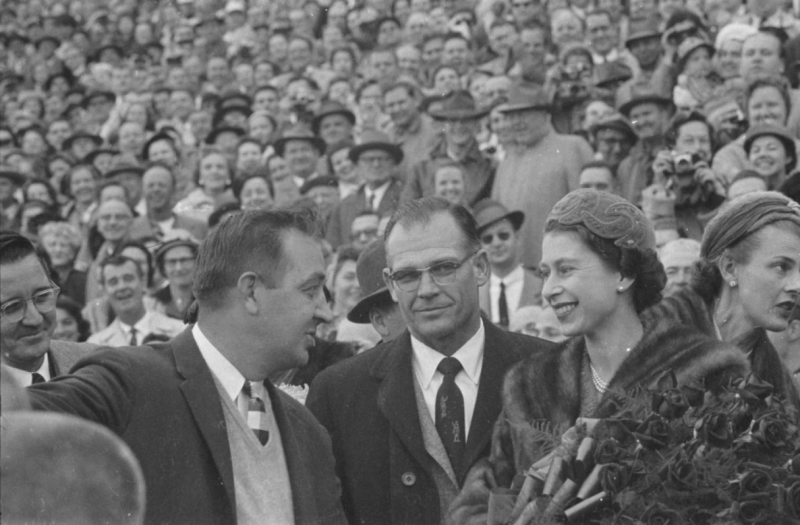 Queen Elizabeth II (second from right) with University of Maryland President Wilson Elkins (center) and University of Maryland football coach Tommy Mont at the 1957 UNC vs. Maryland football game, held in College Park, MD. William Friday, President of the University of North Carolina, is on the far left. The football game, held at Maryland, was part of the Queen’s first state visit to the United States. In honor of the visit, UNC arranged for a BBC broadcast of UNC songs such as “Hark the Sound” to air the day before the game. At halftime, students presented the Queen with a banner, the 1957 Yackety Yack, and stuffed rams for her children. Queen Elizabeth II visit, in the Hugh Morton Photographs and Films #P0081, copyright 1957, North Carolina Collection, University of North Carolina at Chapel Hill Library. 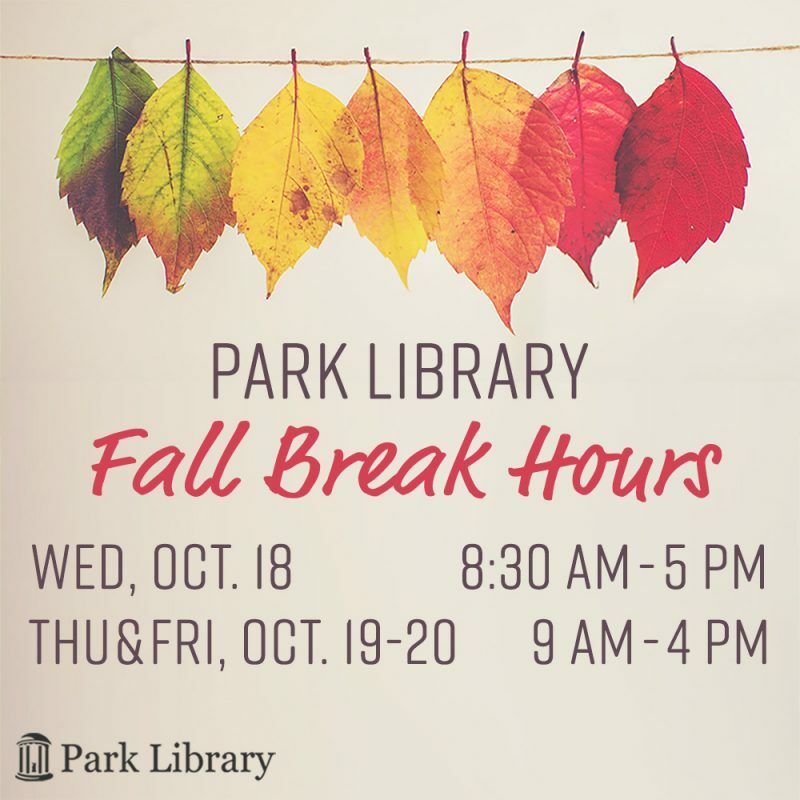 Planning to get ahead on your work this Fall Break? We’re here for you! October 18th: 8:30 a.m.–5 p.m.
October 19th & 20th: 9 a.m.–4 p.m.
Our regular hours will resume on Monday, October 23rd. 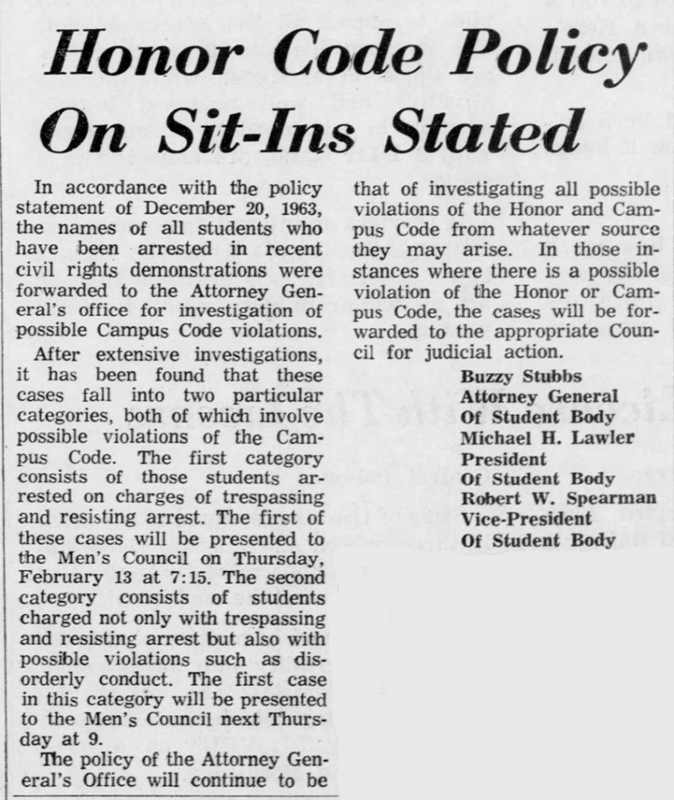 In the lead up to First Amendment Day, we’ve highlighted some of the student protests held at UNC during the 1960s and 1970s. 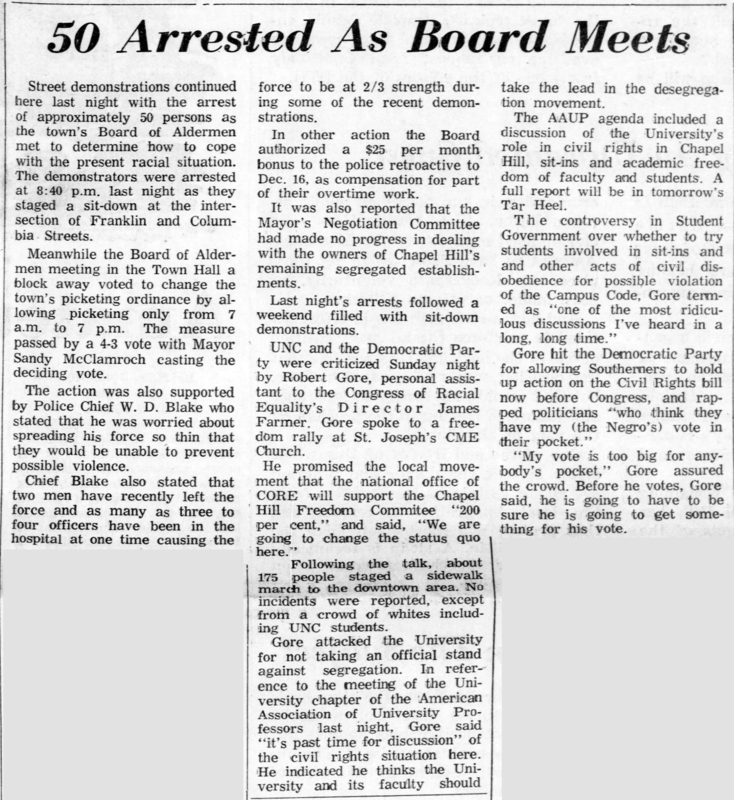 Our series culminates today with Jim Wallace’s striking coverage of a civil rights demonstration on Franklin Street on February 8, 1964. Photo copyright Jim Wallace, used with permission. In 2012, Jim Wallace spoke about the civil rights movement and his book at the School of Media and Journalism. Read the full Daily Tar Heel issues from Feburary 8, February 9, and February 11. Check out Jim Wallace’s book, Courage in the moment : the civil rights struggle, 1961-1964. 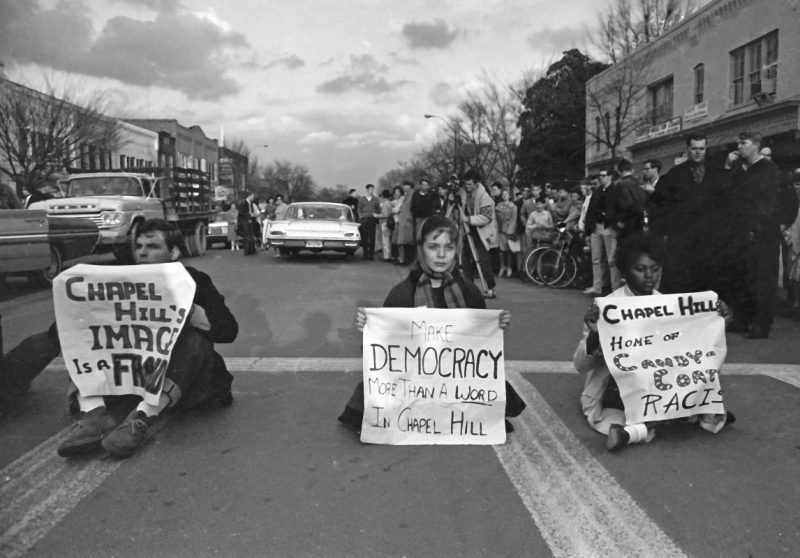 Read more about integration protests at UNC and see other primary source documents in the “I Raised My Hand to Volunteer” online exhibit. View Jock Lauterer’s photographs of the Vietnam peace vigils and the Speaker Ban protests from earlier in this series. For holidays and other exceptions, please see our full calendar here. 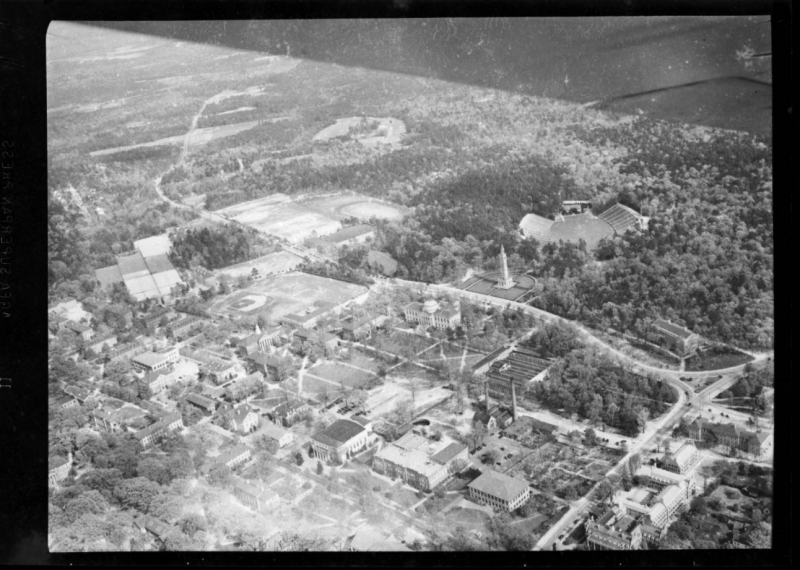 Think campus looks different after all the summer construction? It’s nothing compared to the changes since 1942. 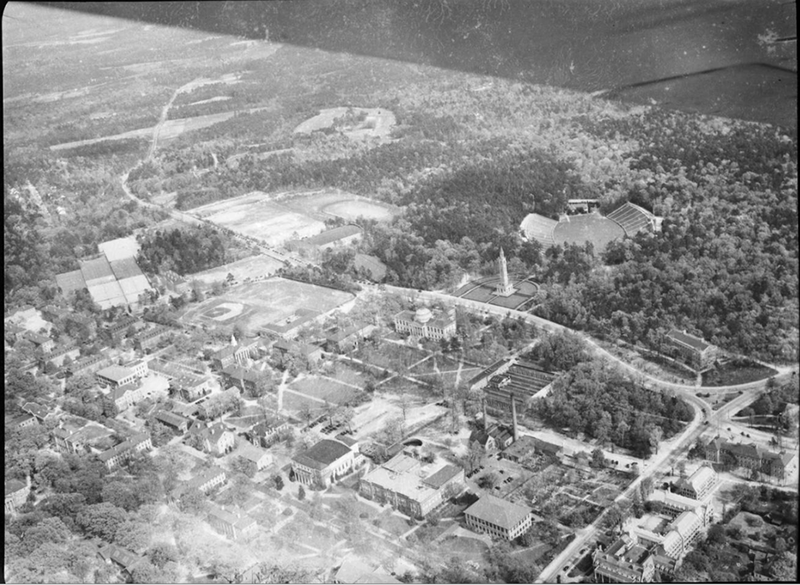 Our favorite buildings (Carroll Hall and most of the libraries, naturally) hadn’t been built yet. Had yours? Google earth V 9.1.39.1. 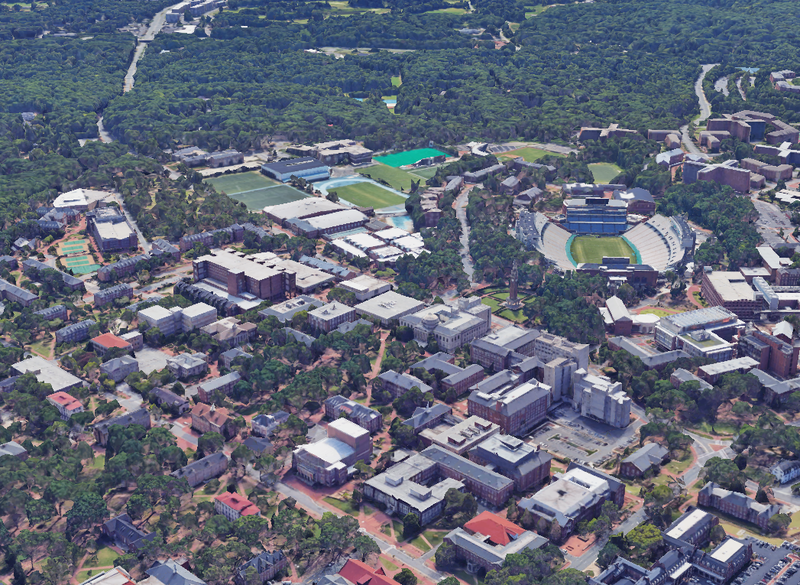 [UNC campus], 35° 54′ 47″ N 79°, 03′ 34″ W, Eye alt 588 m. SIO, NOAA, U.S. Navy, NGA, GEBCO. Retrieved from https://earth.google.com/web/@35.90962794,-79.0484972,148.56411385a,1159.43280009d,35y,111.46861517h,67.75728218t,0r [August 11, 2017].